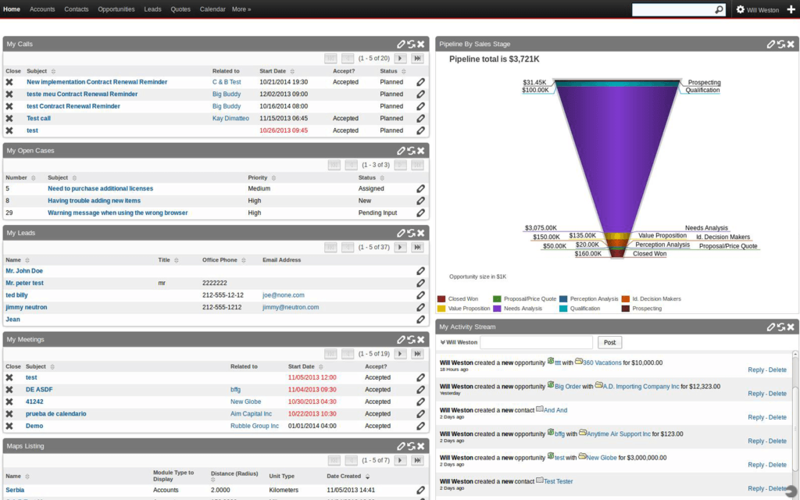 SuiteCRM est une solution open source de gestion de relation client (CRM). SuiteCRM est issu de la communauté de SugarCRM en 2013. 26 Octobre 2015 - 130MBSuiteCRM 7.3 is the new production release of SuiteCRM. Packed with new features, functionality and bug-fixes. Inline Editing: Edit fields directly on the List and Detail View by double clicking the field. Inline Editing: To turn inline editing off for a particular field view the field in studio and uncheck "Inline Editing"
Improved Mobile Navigation: New improved mobile menu layout, designed to give you full control, using less screen space. There have also been various bug-fixes in the 7.3 release. 26 Mai 2015 - 130MBThis is a bug fix release which addresses bugs in the SuiteCRM 7.2.1 release and also Post-Auth RCE vulnerabilities in SuiteCRM. Fix for search placeholder language and value default. Fix for detail view on mobile to make it more optimal. *Fix for colour picker default values in SuiteR theme, as some values were incorrect. Reverting Calendar change as is it causes a bug when navigating to calendar from another module. Icons now output directly to the page so they can pickup on the page styles and do not need to load the css for each icon. Moved calendar screensize check to cal.js so it only loads on the calendar module. Image Field - New image field type, allowing adding of image fields via Studio. Add attachments to the case update thread within SuiteCRM. Re-open Cases from client email update (Configurable). 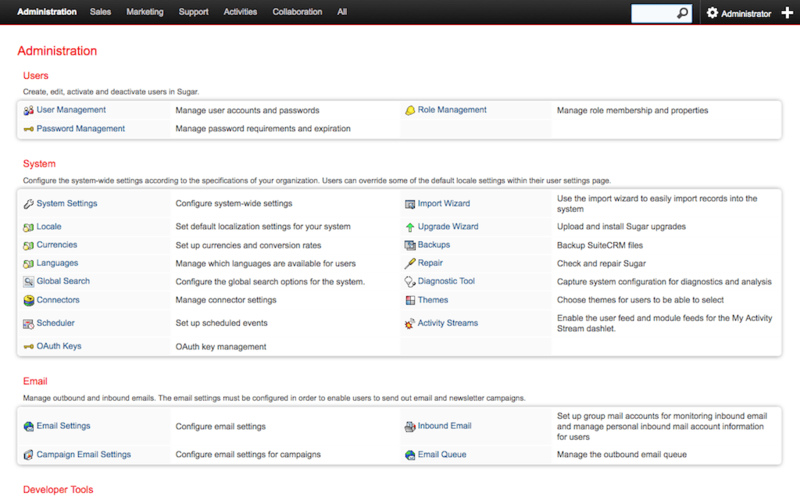 Multiple inbound email box set up, allowing assignment of created cases to multiple users. Gantt Charts added to Projects. Resource Management added to Projects. Project Templates added to Projects. 20 Janvier 2015 - 130MBThis is a security update released to address certain security vulnerabilities identified during routine QA checks. Unauthenticated users may retrieve contents from system-generated files. Regex issue with jsCharts.js when using php 5.5. Fix for reply to all on email not picking up CC addresses. AOP: Trigger user email update even if contact is unknown. AOP: Fixed Localisation issue in case updates. AOD: Fix multienums not being indexed correctly. AOR: Added missing .pdf extension on reports. AOW: FIXED trying to send email to empty email address. AOS: Fixed bug saving line items save incorrectly, when pressing return on the line. 25 Septembre 2014 - 130MBThis is a security update released to address certain security vulnerabilities identified during routine QA checks. Authenticated admin users may cause arbitrary code to be executed. Authenticated admin users may initiate a cross-site scripting attack. Fix bug in AOD which could cause errors when trying to load certain modules. Prevent AOD creating multiple indexes caused by security suite preventing access to the index. Fix undefined index in AOD. Set quote/invoice numbers when records are created with an existing id. Ensure that the contact in a contract is populated when converting. Fix Workflow not sending emails on initial save. Fixed "one of" not working with multiselect fields in workflow. Fixed checks in FP_Events which would cause code to unnecessarily run. Fix bug where using the select this page button for delegates would only appear to do so.